So what’s with all the hype about the Scandinavian fiber crackers also known as GG’s?! Well, for starters they are super high in fiber and very low in net carbs, meaning you can enjoy quite a few of them without feeling guilty or bloated. My dear friend Tanya Zuckerbrot introduced me to them years ago and I have been obsessed ever since. 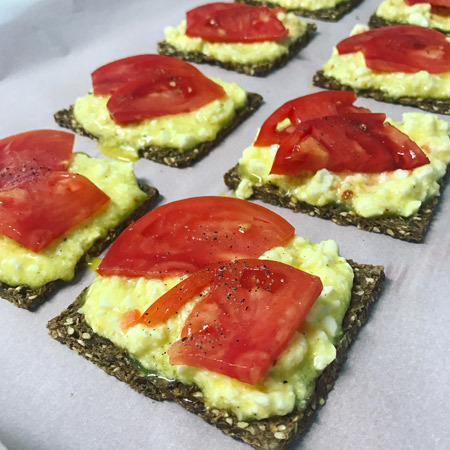 Tanya, creator of the F-Factor diet, has helped thousands of people around the world to loose weight while eating these fiber crackers and following her F-Factor diet plan. Tanya recommends starting the day off with four GG’s as that will ensure you will stay full up until lunch without munching on empty calories. She says, “if you are going to have 1, you must commit to 4.” Four filling fiber crackers contain only 80 calories and a whopping 16g of belly filling fiber! They are the perfect swap for a carb loaded bagel (1 bagel has the same amount of calories as 6 slices of bread!) or toast. 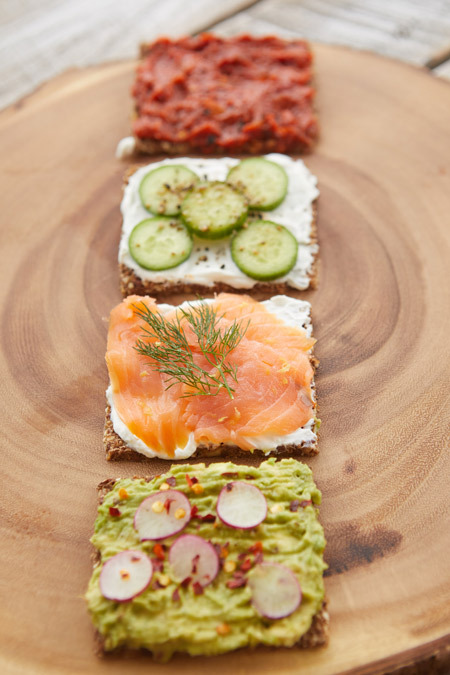 GG crackers are not gluten-free, but due to their high content of fiber they are very low in gluten and net carbs. Unless you have a gluten allergy, you should be absolutely fine eating GG’s and enjoying your weight loss journey. I myself avoid gluten as much as possible, but since I am not gluten intolerant or celiac, I have no problem eating these miracle crackers. My stomach has never been flatter! Since I eat GG’s for breakfast everyday, I have gotten creative with my toppings. Below is a guide to my absolute favorite toppings, some of them being vegan friendly. What I love the most about these GG’s is how healthy and versatile they can be. You can make a sweet or savory topping by adding your favorite fruits, vegetables, nut butters, hummus or vegan yogurts. The possibilities are endless! Vegetarian Croque Monsieur aka Cheesy Egg GG’s – top GG’s with a mixture of 1 beaten egg, 2 tbsp feta or goat cheese, 2 tbsp shredded vegan mozzarella and sliced tomato. Bake for 10 minutes on 400 F.
Princessa – top four GG crackers with grass-fed ground beef and bake on 400F for 10 minutes. What you will need – in a mixing bowl, combine 1/4 lbs grass-fed ground beef, 1/2 tsp cumin, 1 tbsp chopped parsley, 1 tbsp chopped green pepper, 1 tbsp chopped red onion, 1/4 tsp chili flakes. Season with sea salt & pepper to taste and mix well. Top the GG’s with the beef and sprinkle a little bit of shredded vegan mozzarella or shredded goat cheese on top. Pop in the oven and serve with sliced tomato! Lox Heaven – spread a spoonful of Kite Hill vegan cream cheese over GG’s, top with lox, thinly sliced red onion, a few capers, dill (if you have some laying around the fridge) and a squeeze of lemon. Egg Scramble – if I could, I would eat this every single day and not get bored of it. Top your GG’s with softly scrambled eggs, a little bit of crushed black pepper, chili flakes and enjoy. Flavorful Fig – spread a good quality ricotta cheese over GG’s, top with sliced figs, walnuts and if you want a little sweetness drizzle with fiber syrup. Greek Tarama – if you have been to Greece then you must have tried their famous taramosalata. It is made by whisking tiny fish eggs with olive oil and lemon. Taramosalata can also be purchased at most health food stores and on amazon. Zesty Tzatziki – Another delicious Greek spread, top your GG’s with my zesty tzatziki. Fancy Salmon Roe – spread a good quality ricotta cheese over GG’s and top with fresh salmon eggs. Healthified Pizza – one of my all time favorite for a healthy cheat meal ;). Preheat oven to 400 F, top GG’s with tomato sauce (I like Rao’s marinara), sprinkle with vegan mozzarella cheese, a little bit of oregano, chili flakes and pop in the oven for 8-10 minutes. Pesto Chicken – spread this pesto onto your GG’s and top with shredded chicken, and sliced kalamata olives. Avo + Egg – this combo cannot get any better. 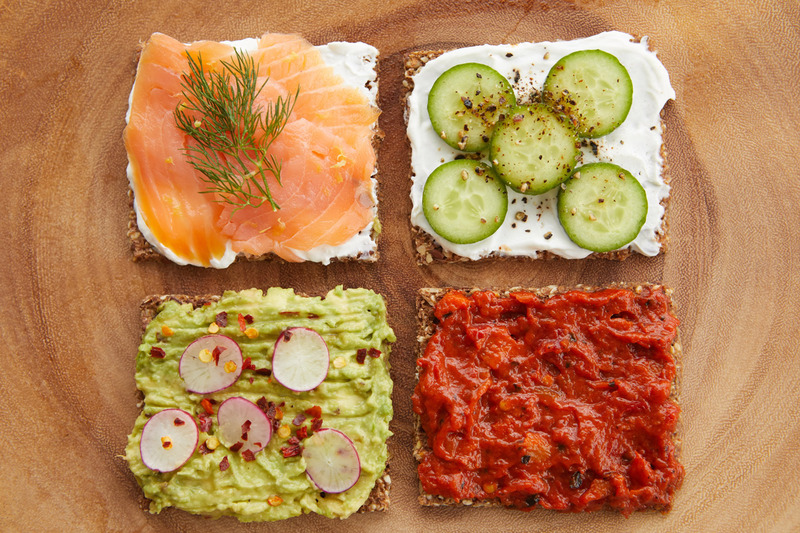 Spread your GG’s with smashed avocado, top with a fried or poached egg, goat cheese and sprinkle with chili flakes. 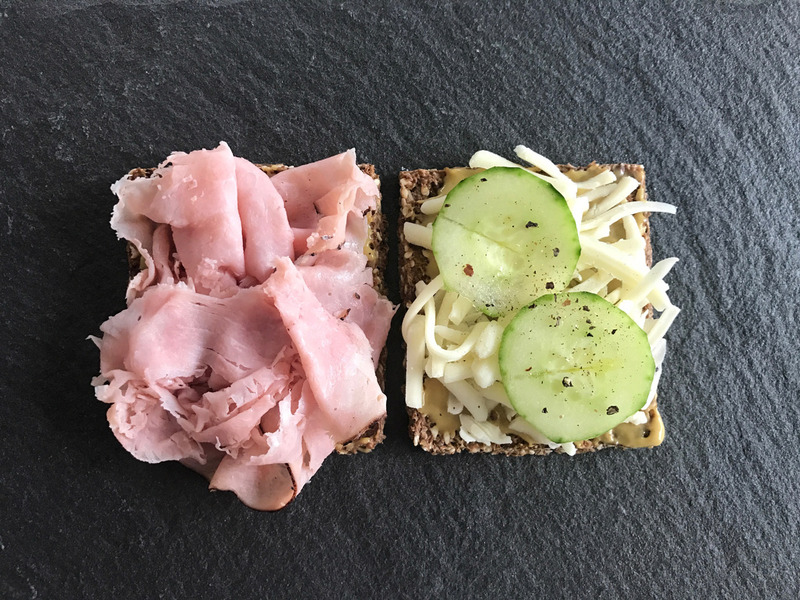 Ham & Cheese Sandwich – I often make a GG sandwich and bring it with me when I have a long day ahead. Spread a spoonful of Dijon mustard over GG’s, top with organic ham (I use Applegate), shredded vegan cheese, and sliced cucumber. Hummus Delight – top GG’s with roasted red pepper hummus and thinly sliced cucumber. Smashed Avocado – in a small bowl, mash 1/2 avocado with squeeze of lime, 1 tbsp chopped cilantro, 1/4 tsp cumin, and crushed black pepper. Spread evenly on GG’s and sprinkle with nutritional yeast. PB&J – spread a spoonful of organic peanut butter, top with a good quality jam (I like Juice Press’s berry jam) and enjoy. , top with thinly sliced banana, drizzle with maple syrup and sprinkle with cinnamon and chia seeds. Coco-Nut – top your GG’s with a vegan coconut yogurt, slices of kiwi, and orange zest. Yummy Lutenitsa – just like the above’s Bulgarian Kid’s Fav Combo but without the feta cheese! Flavorful White Bean Dip – similar to hummus, make this white bean spread by combining white beans, sun dried tomatoes, jalapeño pepper, garlic, roasted red pepper, lemon juice, mint and pulse in the food processor until smooth. Top your GG’s with the white bean spread and enjoy! Arugula Pesto with Mushrooms – spread this pesto onto your GGs and top with sautéed mushrooms. Super yum! Tofu Scramble – instead of eggs, make scrambled tofu with your favorite veggies and top your GG’s for a protein-filling breakfast. Baba Ganoush – spread a spoonful of baba ganoush over your GG’s and top with pomegranate seeds. Baba ganoush is a Middle Eastern dip that is made out of grilled eggplant, garlic, tahini, and lemon. It can be found in many health food stores. Sun Dried Tomato – top GGs with vegan cashew cheese (tastes similar to goat cheese) and place sun dried tomatoes on top. Juicy Peaches – spread a spoonful of a vegan peach yogurt (I like Kite Hill) and top with a thin slice of peach. It is the bomb! These look great! I recently purchased some of the GG crackers (the ones you linked) and they look very different from the crackers in your photos… mine don’t have any seeds, they’re just brown. Am I using the right ones? Hi Jill, they have different types of crackers. The ones with the seeds are “pumpkin” or “sunflower”. If i am not vegan what do you suggest for cheeses? If you are not vegan then goat’s cheese is best! I love these with cream cheese sprinkled with Everything Bagel seasoning from Trader Joes! Better than any bagel!